Here are 20 food swaps that you can do for the autoimmune Paleo protocol (AIP diet) instead of Standard American Diet foods. 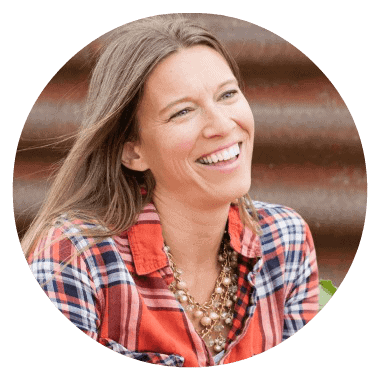 One of the hardest parts about doing AIP is that people are kind of scared of all of the things that they can have it is a lot different than the regular Standard American diet or even quite different from Paleo. I think this fear holds a lot of people back but it really shouldn't and today I want to give 20 different swaps that you can do food swaps that will just make life a little bit easier for you. You can either watch this video to hear the swaps or skip below and read them! And even can be swapped for oats because I've made some delicious granolas with Tigernuts instead of oats. Now Tigernuts, also called nookon or chufa are not actually nuts but a tuber. So they are completely compliant on AIP. Roots makes a great tigernut butter or you can make your own by blending tigernuts and approx 1 cup of oil in a blender or food processor until it’s in a nut butter-like consistency. I love it on this AIP English Muffin recipe or in a tigernut butter and jelly wrap sandwich (like I showed in this video). You can replace cow’s or almond milk pretty much one-to-one in most recipes and they do a great job. Make sure your coconut milk doesn't have guar gum in it, as that's not allowed on AIP. 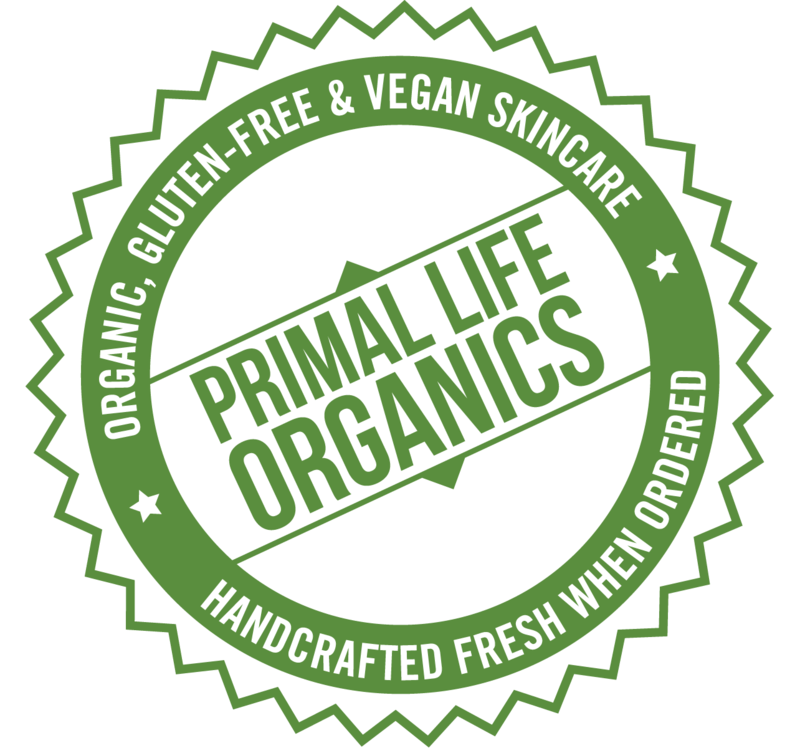 I use the Native Forest Simple Coconut Milk. Veggies like butternut squash, sweet potatoes, zucchini, beets, or any of these kinds of bulky vegetables are great for spiralizing and making into veggie noodles. See how to make sweet potato noodles here. If you don’t have a spiralizer you can also use a julienne peeler to make long strips of veggies. You can also roast and use spaghetti squash instead of pasta too. Avocado oil is great that it's already in the liquid state so you don't have to melt it like coconut oil, but you can use coconut oil as well. (Or lard, tallow, or olive oil) *If you have a Costco membership, I've found the Chosen Foods Avocado Oil is typically cheapest there (it's ridiculously expensive on Amazon, so don't get it there). Mace is red coating that covers the outer shell of the nutmeg kernel. It’s a bit milder in taste, but tastes surprisingly like nutmeg, so it will replace nutmeg in all of those pumpkin spiced things you need to eat! This combination takes a little bit of getting used to, but it's actually a surprisingly good replacement for coffee. It has no caffeine and it’s legal on AIP since it’s not seed-based ( coffee is a seed and we avoid seeds on AIP). If you get the ratio right for you it provides a good amount of bitterness and can be everything that you're expecting from a cup of coffee. This is a good recipe to start with, but play around with the ratios as I find this much chicory to be too bitter for me – skip the coconut concentrate and oil if you don't want to make it “bulletproof”. Of course, you can always drink tea instead to keep warm. I've been obsessing over these tea crystals lately and even though I've never been much of a tea fan, have been drinking like 3 cups a day! 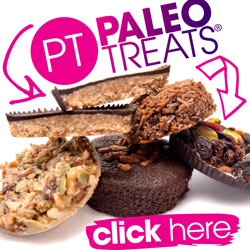 Sadly, chocolate is a seed so must be avoided on AIP. But carob can be used as a replacement. It’s definitely got a bit of a different taste, but it’s good in these AIP Carob Chip Cookies! And I also like it mixed with some coconut oil and honey and drizzled over fresh fruit. Caution: Be careful that you avoid pre-made carob chips, or at least look at the ingredients, as many use wheat and other non-AIP ingredients as stabilizers. If you’ve never had a white sweet potato you might be surprised about how not sweet they are. The fact that they are that white color also can trick your brain into thinking that you're not having something so sweet as a regular orange sweet potato too. White sweet potatoes are usually marketed as Japanese White or Jersey White and either have a light golden colored skin or a reddish purple skin. Cauliflower rice is pretty prevalent these days and a normal staple of a Paleo or Whole30 diet, but in case you’re coming from a Standard American diet, here’s how you make it: Just take a food processor or blender and pulverize the cauliflower until it’s small like rice. You can also buy pre-riced cauliflower in most grocery stores these days- usually either in the prepacked salad section of the fresh veggie aisles or in the frozen section. Cook on the stove for a few minutes until tender. Our favorite recipe is this Coconut Cauliflower Rice recipe. If you want that cheesy kind of flavor without cheese you can use nutritional yeast. It gives a little bit of a cheddar kind of flavor to dishes. Common uses are in mashed sweet potatoes or mashed cauliflower as a side or in a runnier version of these (mixed with something like chicken broth) to make a “cheese” sauce. Sweet potato chips (I like these by Jackson’s Honest), Plantain Chips (I love these by Inka Chips) and Cassava Chips (I like these by Artisan Tropic) are really good replacements for tortilla or potato chips. Plantain chips hold up especially well if you want to dip some guac or anything like that, and all of these make great sides for on-the-go meals. You can do coconut milk yogurt, which is great with fruit and tigernut granola as a breakfast or snack, but I do caution you that you should probably make it at home by yourself because the stuff in the store has a lot of additives in it that aren’t AIP-compliant. If you do make it yourself, you should use either a starter that is (AIP compliant which I'm not really sure of one but please let me know if you know of one) so I would instead I would recommend using probiotic pills as your starter. This video was a Facebook Live I did for an Instant Pot Week Challenge and explains how to make coconut milk yogurt in your Instant Pot. Kombucha can still be fizzy and have all sorts of flavors, yet has health benefits rather than detriments like soda. It’s still fun to have tacos on AIP, but instead of using corn you can make your own cassava flour tortillas. It took me a few tries the first time to get it right without the tortillas completely breaking on me, but once I figured out how to do it I found it’s not hard. I love this cassava flour tortilla recipe by Downshiftology. Arrowroot powder (also called arrowroot flour or arrowroot starch) can be used 1:1 instead of cornstarch to thicken sauces or gravies. In a recipe that you might be modifying yourself from non-AIP, you can use baking soda and cream of tartar instead of baking powder (which typically either contains corn or other non-AIP ingredients). Squirrel in the Kitchen has a great AIP Baking Powder recipe you can make and store in your pantry. Now I wouldn't say that you’d want to spread these on top of a baked good (at least not without some additional ingredients – this is a good AIP “butter” spread recipe) but instead of butter in a recipe you are modifying yourself, then you can typically use these 1:1 for butter. Want a printable version of these swaps? 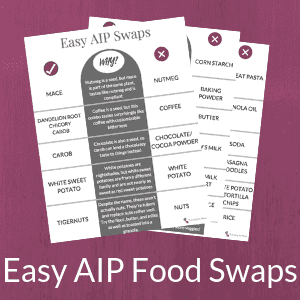 You can get the AIP Swaps Cheat Sheet (plus tons more stuff) inside my Paleo Freebie Library! Get the password here.